As the owners of a small brewery, we had strong opinions about what our branding should look like but we are not graphic artists. Flourish Design has enabled us to take our vision and incorporate a business aesthetic which runs throughout all our visual marketing, from website design to rack cards. Anna listens to us and translates our ideas into beautiful images that fit our business culture. She is an expert at turning words into images and always patient in the design process, even if that means multiple revisions. As the business has grown, we have used Flourish Design for a host of projects, from creating beautiful labels for our beer bottles to posters for events at the brewery. We have never been disappointed in the end result when working with Flourish Design. We have recommended Flourish Designs to many other business owners and will continue to in the future. 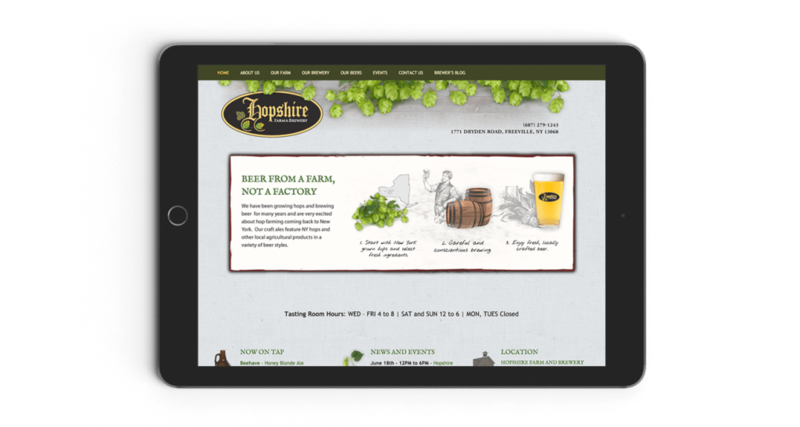 My favorite aspect of working with Flourish Designs is the shared vision we create together for Hopshire Farm & Brewery, and the ease of the design process for non-designers like ourselves.